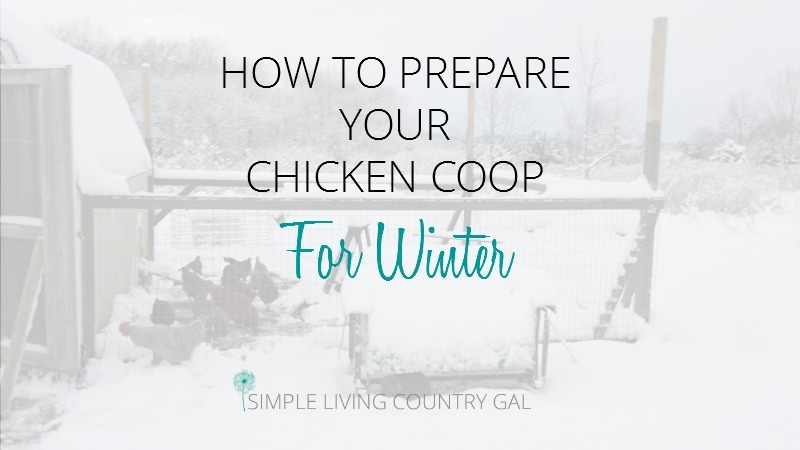 Whether you live in the north where winters can get pretty brutal or in the south where things just tend to cool down a bit, taking time to prepare your chicken coop for winter is a chore on everyone’s to-do list. It is a good habit to have even if you are not preparing for -25 wind chills since it gets things cleaned out and cleaned up which is key for healthy birds. It also helps to keep us more aware of our animals living conditions on a regular basis. Routine maintenance is key in all areas of our homes. By checking our property and our homes, we will more easily find issues before they become full blown problems. This habit is even more important if you raise any animals. Checking their housing and shelters routinely is vital and can keep you ahead of the game. By keeping a seasonal checklist you will ensure you are always watching out for issues before they become problems. 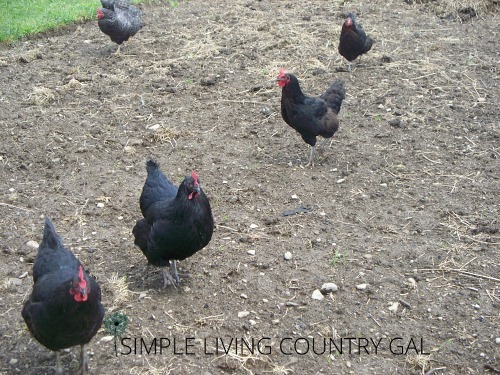 If you are new to raising hens this list will give you a good overview of what needs to be done. As you gain more experience you will learn what items to add and what items you can skip over. It really all depends on where you live and the type of shelter you have. This list will, at the very least, get you started off on the right foot. Why do I need to prepare my chicken coop for winter? Preparing your chicken coop for winter is just like preparing your home. You are basically looking for any issues, fixing them if you find any, including any improvements, and above all making sure your animals have a clean and comfortable home. Our goal is to make sure our animals are safe and healthy at all times. The first step to doing this is to perform routine checks on shelters and food set ups. This will alert you to any weak areas where predators might be able to enter the coop. It will also show you if you have a bully issue because your feed and water set up isn’t sufficient for your flock. All of these things may not be noticeable when you are simply feeding but will stand out when the coop is emptied out, cleaned and a walkthrough is performed. Start your winter out with a clean and secure coop and you will save yourself from headaches come winter. Step #1 Empty out your chicken coop. 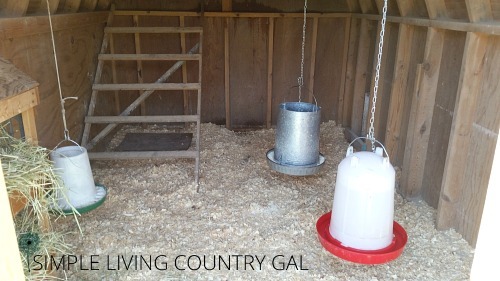 The first step to prepare your chicken coop for winter is to give things a good cleaning. There is nothing worse than dealing with parasites in the winter, so take the time now to debug things a bit. I like to take everything out. The nesting boxes, all of the bedding, waterer, and feeder. All of it. Once the chicken coop is emptied, get a good broom and sweep it all down. The floor, walls and even the ceiling. You want to remove any cobwebs that can trap dust and debris. Ninja tip: This step can be pretty tough on the lungs so a face mask like this one or even just a bandanna will help you from breathing in the dust and debris. I also use a paint scraper to get anything off the floor or walls that a broom or shovel can’t get. Ninja tip: Keep a paint scraper in your coop and every week scrape down your chicken roosts. This will keep things from getting built up making it difficult for the hens to roost comfortably. READ: CHICKEN ROOSTS 101 – EVERYTHING YOU NEED TO KNOW AND MORE! If you have a garden this is a great place to toss your bedding in the fall. 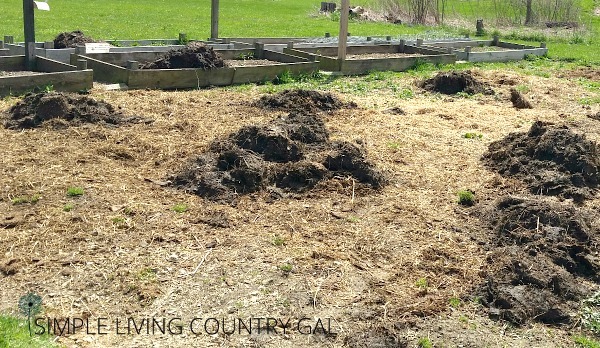 Soiled bedding is a great compost and will do wonders for your veggies come spring. Ninja tip: Just remember to never add fresh chicken manure directly to plants or you will do more harm than good. Raw manure will burn and even kill a plant so instead let things compost down either over winter on your garden or in a compost bin. If you do not have a garden find a spot out of the way to dump your bedding for now. Come spring if you let your neighbors know you have chicken manure they will gladly get rid of it for you. Step #2 Hose it all down. Hopefully, you are near a water source because having a hose close by will make this job 10 times easier. If not, tossing buckets of water up onto the walls will do the trick as well. The goal is to use the water to get what the broom missed. Make sure you get the walls, corners, and even the ceiling. Chickens are dusty (incredibly dusty!) and you will be amazed at how quickly things can get dirty in a coop. Step #3 Scrub it all down. I like to use a mixture of white distilled vinegar and water mixed at about ½ and ½. This will do just fine cleaning the coop out. If you have a problem with parasites or mold you may want to add some bleach. you may need to do more, but more often than not this will do the trick. Step #4 Scrub down vents and windows with a soft brush. It is extremely important to make sure your vents and windows are completely clean of all dust and cobwebs. Even in the frigid winter good airflow is extremely important. Step #5 Rinse your chicken coop out. Once you have it all scrubbed, grab your hose once again and give it a good thorough rinse. Get the floors, corners, ceiling, walls, vents, door frame…..all of it. At this point things should smell much better than when you started. A good sign you are doing a thorough job of it. If you do not have drains in your chicken coop to help with the excess water then simply use the broom to push the excess water out. Step #6 Let it all dry. Hopefully, you have a place for your flock to hang out until things dry up. I just let my gals roam in the garden. They will usually move that dirty bedding around for me while I am cleaning the coop. I like it when my animals do the hard work for me! Step #7 Check your chicken coop for damage, cracks or leaks. When you prepare your coop for winter you will need to make sure things are in good shape. Drafts are a big no-no in the north. Sure you want air flow, but not drafts. Why? Because drafts can cause lung issues in your animals. Pneumonia or flu can kill your chickens quickly so it is important to make sure your coop can withstand the winds of winter. Also, a small crack in the dead of winter can let in a surprisingly large amount of snow. Trust me…I know. Another reason we want to watch for cracks or holes if to keep predators out. 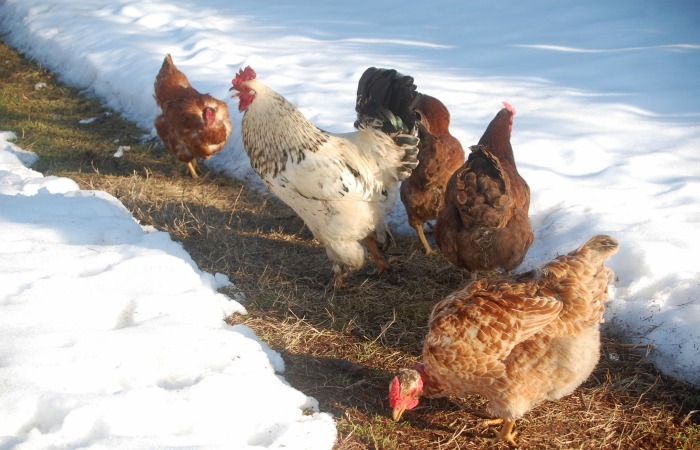 Your chickens may not be the only ones looking for a warm place in the cold of winter. We had a weasel break into our coop using the smallest of holes to get in. He was able to kill my best hen and we learned a tough lesson that day. I am now careful to look for any cracks no matter how small and seal them up. Prep your chicken coop to protect your hens not only from the snow but also from other animals. Step #8 Don’t forget the rest. Take this time to give your nesting boxes, feeders, waterers, and roosts a good cleaning as well. Scrub things down with your vinegar/water spray and let dry in the sun. Remember to add bleach if needed. Step #9 Put fresh bedding into your chicken coop. I like to put down a light layer of food grade Dematiaceous Earth before I add anything else. This extra step just ensures that I am doing all that I can to deter pests and parasites. Next, goes a nice layer of wood shavings. (Do not use cedar) With our brutal winters I prefer to use the deep litter method in our chicken coop. It not only saves me from cleaning in heavy snow but it gives a nice warm barrier between my hens and the cold frozen ground. I have used sand, sawdust and wood shavings, I find wood shavings work best. If you are older like I am I do NOT recommend sand. Sand is heavy, very hard to move and does not keep the smell down like wood shavings. Step #10 Put fresh straw in the nesting boxes. Since I use plastic crates for our hens they are super easy to clean and do not hold the smell of the coop. Still, a nice layer of straw makes it more comfortable for my gals come laying time. I also started tossing some fresh basil in as well and the girls really like it. If you like these nesting boxes, you can see how to make your own Chicken Nesting Boxes! 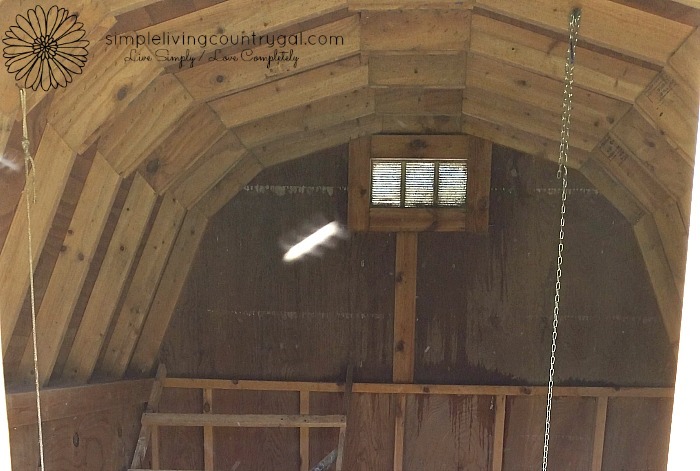 Do I need to add a heat lamp when I prepare my chicken coop for winter? I have raised chickens going on 7 years and I have used a heat lamp for the first 3. I live in a very cold climate right in the middle of the snow belt. And let me tell you, we get cold with dangerous wind chills and a crazy amount of snow. I have found that my girls do better WITHOUT the heat lamp. Ninja tip: The number one cause of fires in a coop/barn is a heat lamp or other artificial heat source. Make sure to use every single precaution if you feel you must had a heat lamp to your chicken coop. Trust your animals to adapt to the cold especially if you have chosen winter hardy hens. As long as you have adequate housing that free from snow and drafts with ample bedding inside, your hens will do just fine. If however, you feel you need something to help them cope try giving them warm water 1-2 times a day. The chickens will love it and it will warm them up nicely. You can even mix in some of their grain to encourage them to drink it. This is something I do on crazy cold days and it really does help them cope better. Ninja tip: If you live in a very cold climate then you may need to give a little extra protection to help keep your girls safe. 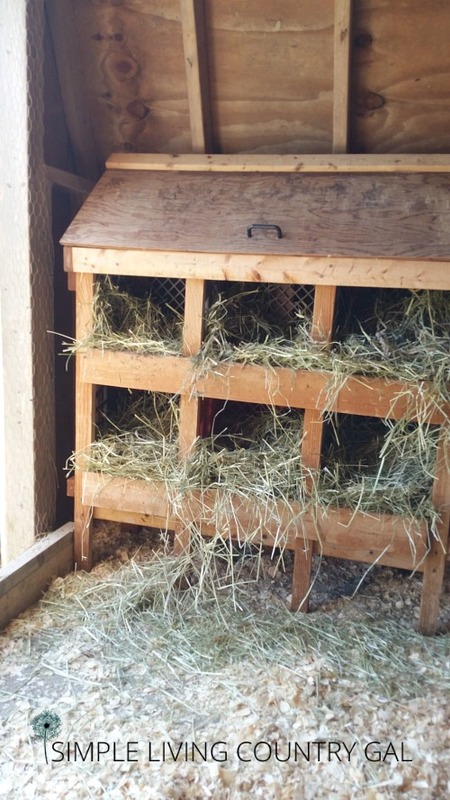 You can use hay bales to line the interior of your hen house forming a make shift cocoon. This is what we do and even with 25 blow zero wind chills our flock has kept warm all winter long. If egg production slows way down for you, you may want to add a light to extend the day. I have found this DOES work, although I do not use it. When a chick is born she already has a set number of eggs she will lay in her lifetime. If you speed up the laying of those eggs, she will slow down quicker. I prefer to let nature take it’s course with my hens. Bonus Step – Don’t forget to check the run. When the winter hits, you need to make sure your run can withstand the snow and wind. If you have an open run like I do, be prepared to shovel some snow. Chickens will come out in the snow, but sometimes they will not come in for a while….even if their feet get cold. 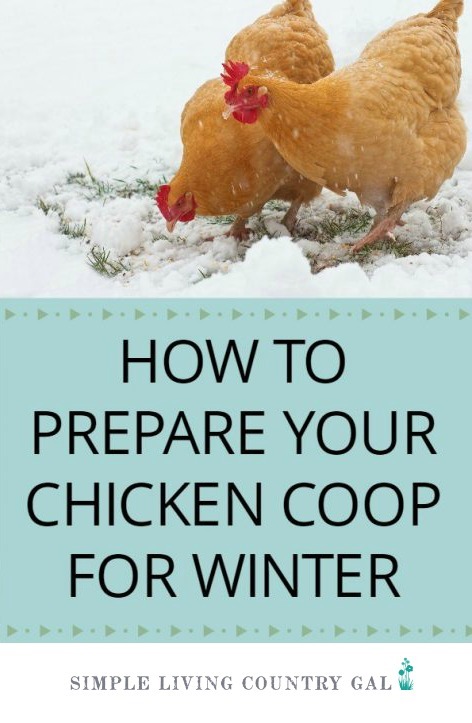 Because of this, they can get frostbite quickly so you will need to make sure you have the snow cleared so they can easily get in and out of the coop. I just shovel a small circular path inside of their run each morning at chore time. To make things easier on myself I have my snow shovel hanging in the run so I can just grab and go. You can sprinkle a bit of straw or hay down to help or just have a few tires and/or logs for them to perch on out of the wet cold snow. 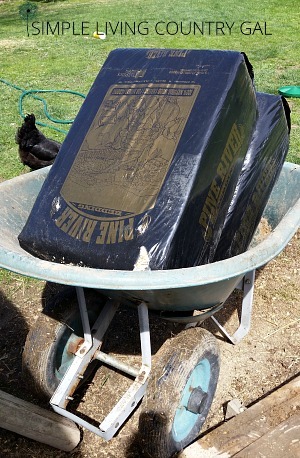 Bonus Step – Add a tarp. Though not pretty the tarp is an effective way to deter some of the snow. 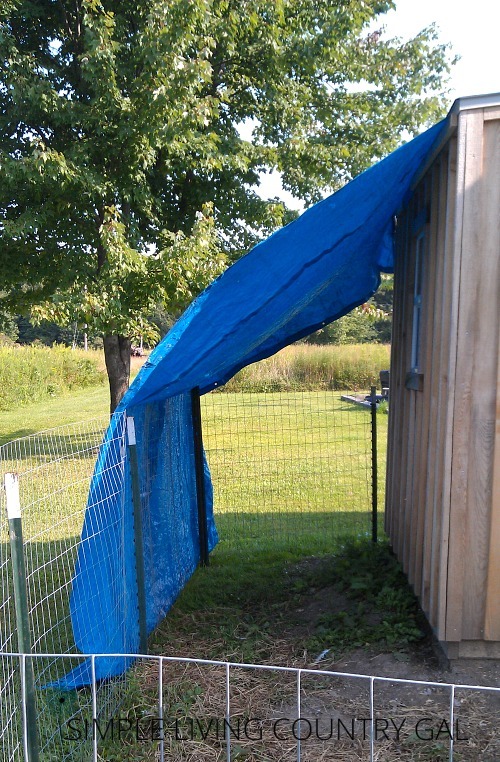 By hanging a heavy duty tarp over a portion of the run you will give a nice dry area for your hens to be in. I like to have bedding down in this area and will even sprinkle some scratch in the morning to encourage the girls to stay out in the fresh air a bit longer. Ninja tip: Make sure to clean off your tarp after heavy snow falls to it does not tear or stretch from the weight of the snow. Another tip is to use the tarp as a wall of sorts. If you have a high fence for your run, you can attach a tarp to one side to keep drifting down. This tip is more for you than the chickens. But for me I can use all the help I can get! I love watching the hens in a freshly cleaned coop. They really check things out and chat with each other commenting here and there on the sparkle and shine. All in all, preparing your chicken coop for winter only takes an afternoon. Sunny days are best. Use that sun to your benefit to dry things up and sanitize naturally. Keeping a clean coop is the easiest way to ensure not only the health of your birds but also large healthy eggs to enjoy all winter long! 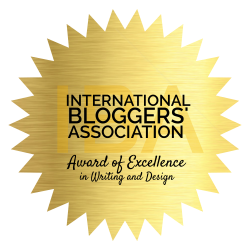 You can find this post over at my favorite Blog Hop!! Thank you for creating this post, it’s easy to forget the coop needs a thorough clean before the winter hits to keep the pests down and reduce the potential for disease. I’m glad to see you also put your bedding on your garden; this is my first time doing it, have you noticed any problems using a large quantity of wood shavings, even if they are soiled from the chickens? I have a pretty large garden 40′ x 80′ and I fill it up with bedding from both the coop and the barn. I dump it in piles and kick it around a bit to spread it out (it is a very technical process you see!) Then I let the snow do the rest. In the north, we get quite a bit of snow and it really helps to compost things down by spring. In the spring Hubby uses the rototiller to work it all into the soil and we then let it sit for about a month. We then use the rototiller to work it in again. That usually is enough to incorporate all the wood and hay in the ground that did not compost down over winter. I had nothing but problems for the longest time, once I started doing this method my garden has really thrived. I hope you have success with this! Thank you for the information, I’m excited to see how it works on my gardens next year! I agree about the heat lamp. Our first chicken house, and most of the chickens burned up because of the heat lamp, and bedding dust. We did not use one after that, but lost many combs and wattles to freezing. It was too cold, up that far north, to let the chickens out any time in the winter, they would have frozen stiff. I used to dream about trying to find ways to insulate the chicken house, that would work better, after we left that place and I began my (divorced) city living work years, which brought me now to your site. I still miss my chickens, though I am old now and probably won’t ever find a rental on a farm. So, I read about chickens, grow veg in pots, and dream. I am so sorry for your loss and I can only imagine the heart break that caused. There are so many barn fires here in the winter and most if not all of them are caused by heat lamps. If you are on Instagram you can follow me and get a daily dose of chickens, goats, and other animal shenanigans! Thank you so much! This is our first winter with 21 new chicks, so I am really still learning what to do. Appreciate all the tips! Welcome to the wonderful world of chickens! Your life will never be the same again, haha! Would this apply to a duck house? I have one drake that found his way to my house and besides feeding and watering him, I don’t know the first thing about caring for him, particularly in the winter. I’m in Virginia and it does get cold here in Jan and Feb. Any advice is appreciated! Thank you! As long as you have a safe, warm place for him to be at night you should be fine. When the snow comes you will want to give a bit more shelter for him. We just have 2 ducks and they hang out with our chickens as if they are one of them. Goofy birds! A large dog kennel will be perfect for him with plenty of bedding inside and duck feed and water.